Dolly Rocker Girl: "...it's nice, people knowing who you are and all of that, and feeling that you've meant something to them." "...it's nice, people knowing who you are and all of that, and feeling that you've meant something to them." Dozens of actresses have portrayed Marilyn Monroe in some capacity. An icon of beauty, fragility, femininity, and Old Hollywood, it's easy to understand why Marilyn's essence is still so present almost forty years after her passing. While I don't endorse the likes of Paris Hilton or Britney Spears dressing up as our dear Marilyn to hawk some new perfume of their's, and I still morally oppose La Lohan's rendition of "The Last Sitting" from a few years ago, I accept (and even occasionally embrace) young actresses who adopt certain characteristics of Marilyn Monroe in their acting. Whether it's Amy Adams doing her best Lorelei Lee impression in Miss Pettigrew Lives For a Day; or Poppy Montgomery, Sally Kirkland, Kim Stanley, Catherine Hicks, Theresa Russell, Sophie Monk, Mira Sorvino, Ashley Judd, and several others who have portrayed the actress herself. In the last few days it has been announced that two biopics about MM are underway. Both Naomi Watts and Michelle Williams are set to portray the tragic screen icon in two projects slated for production in 2011. Naomi Watts, 41, is five years older than Marilyn Monroe was when she passed away. Watts is set to star as the actress in Blonde, the faux-Monroe memoir penned by Joyce Carol Oates. Director Andrew Dominik told ScreenDaily.com, "Why is Marilyn Monroe the great female icon of the 20th century? For men, she is an object of sexual desire that desperately in need of rescue. For women, she embodies all the injustices visited upon the feminine, a sister, a Cinderella, consigned to live among the ashes." 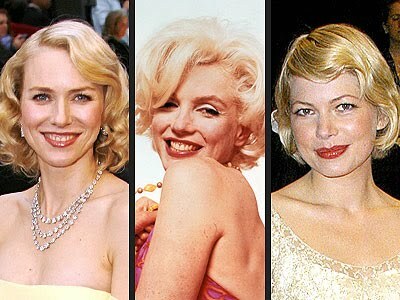 While Dominik had found his Marilyn in Naomi Watts, Michelle Williams was announced to play the late star in My Week With Marilyn (terrible name for a film, but what can you do? ), a story centered around Monroe's time in London during the 1957 filming of The Prince and the Showgirl, her fantastic film with Laurence Olivier. Honestly, while I love both of these two actresses, I find it difficult to imagine either of them in the role of Marilyn Monroe. I do not doubt their respective talents, but I've just never seen them through the bombshell lens. I'm excited to see how these projects turn out, and it will be interesting to finally see an actress besides Scarlett Johansson gain comparisons to Monroe. im excited for both projects. michelle and naiomi were both ladies of heath ledger, my eternal soulmate... michelle is adorable, and i admire and respect her as an actress. I am desperate for hair like this! !